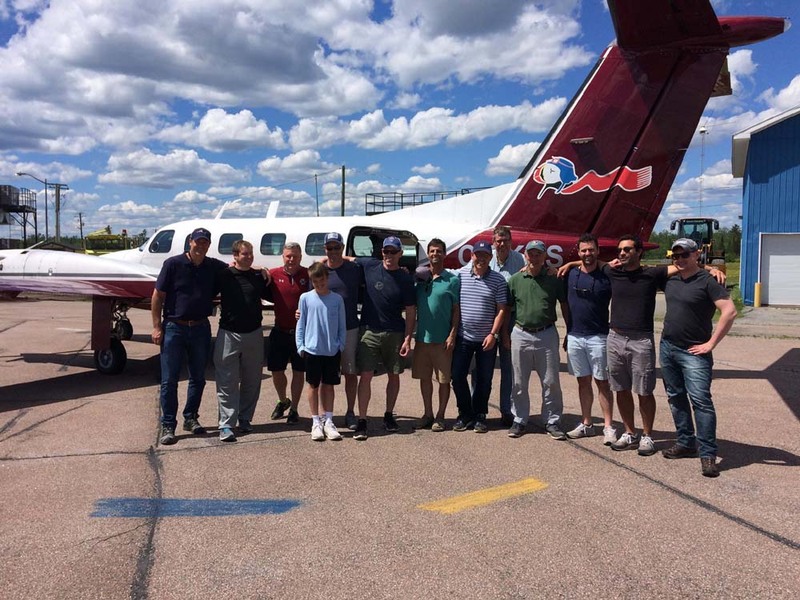 AT COUNTRY HAVEN, WE ARE A FAMILY-OWNED AND OPERATED BUSINESS, ALLOWING US TO PROVIDE SOME OF THE BEST PRICE VALUE PACKAGES ALONG WITH THE WARM EASTERN CANADIAN HOSPITALITY. WE WORK CLOSELY WITH TWO CANADIAN, TWO U.S., ONE GERMAN AND ONE U.K. TRAVEL AGENCIES - ALL ARE CONTINUALLY WORKING TO BRING YOU THE BEST IN AIRFARE RATES. 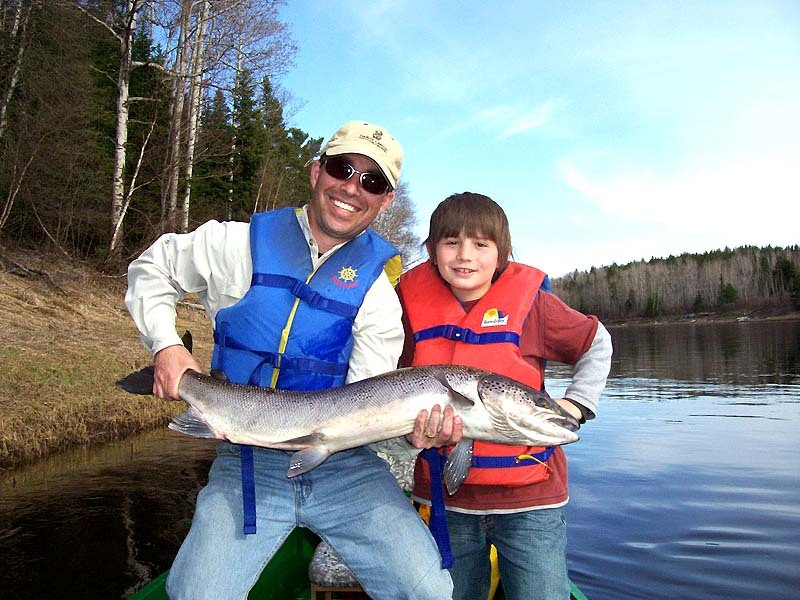 FOR YOUR FISHING VACATION, WE CAN TAKE YOU FROM YOUR HOME ANYWHERE IN THE WORLD, TO THE HOME OF THE ATLANTIC SALMON, WITH OUR 'NO HASSLE' ALL-INCLUSIVE PACKAGES. FOR THE INDIVIDUAL, FAMILY OR GROUP, WE BELIEVE THAT EVERYONE'S NEEDS MAY VARY BUT OUR SUPERB SERVICE AND HOSPITALITY REMAINS THE SAME. WE OFFER YOU A CHOICE OF AN ALL-INCLUSIVE PACKAGE OR A CUSTOM PACKAGE, TAILOR MADE TO FIT EVERYONE'S NEEDS, TO THE BEST OF OUR ABILITY. 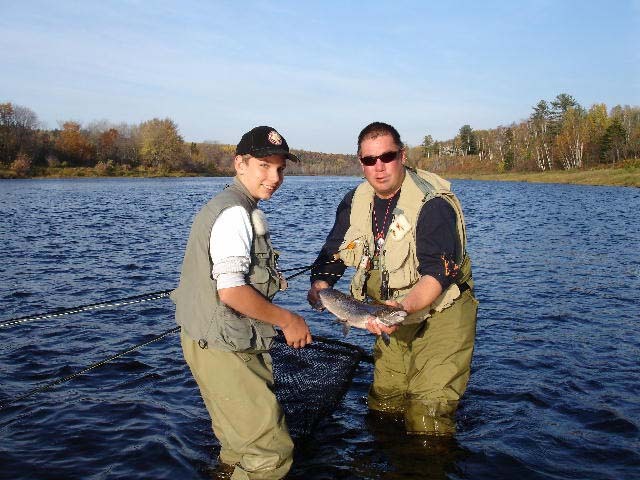 WE TRULY BELIEVE THAT THERE IS NO BETTER PLACE IN THE WORLD TO SPEND QUALITY TIME BONDING TOGETHER AS A FATHER AND SON or DAUGHTER, THAN WITH THE TRANQUILITY OF THE RIVER, FRESH AIR, NATURAL SERENE SURROUNDINGS AND THE CHANCE TO HOOK A MIGHTY ATLANTIC SALMON! THIS ADDS TO AN EXPERIENCE THAT WILL BE ETCHED IN YOUR MEMORY FOREVER. 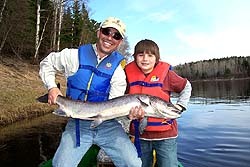 THIS PROGRAM IS IDEAL FOR THE DAD WHO WOULD LIKE TO SEE HIS SON or DAUGHTER CATCH THEIR FIRST ATLANTIC SALMON OR WHO WOULD LIKE TO GET THEIR DAD ON THAT FISHING TRIP THEY HAVE BEEN PLANNING. 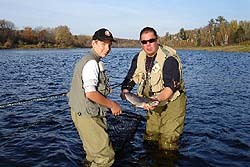 OUR EXPERIENCED GUIDES WILL PROVIDE THE NOVICE WITH FULL INSTRUCTION ON THE TECHNIQUE OF FLYFISHING AND THE SPECIAL ATTENTION THAT MIGHT BE NEEDED TO ENSURE YOUR FATHER AND SON/DAUGHTER EXPERIENCE WITH US IS A MEMORABLE ONE. 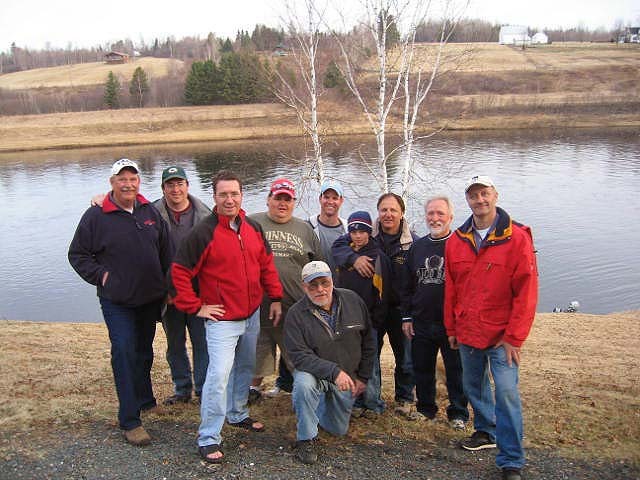 AT COUNTRY HAVEN WE ARE SMALL ENOUGH TO CARE ABOUT THE NEEDS OF EACH AND EVERY INDIVIDUAL FISHERMEN AND BIG ENOUGH TO HANDLE GROUPS WITH THE SAME CARE AND ATTENTION. 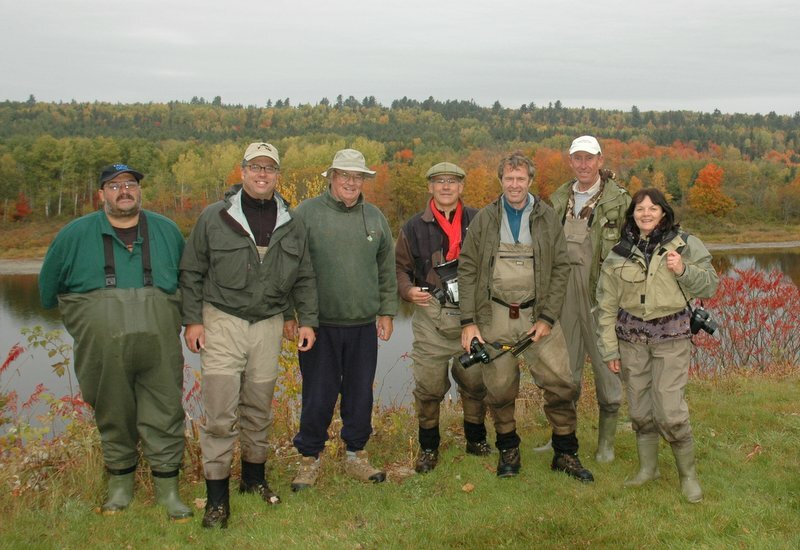 WHETHER YOU AND A GROUP OF FRIENDS ARE SEEKING A FISHING ADVENTURE, LOOKING FOR THAT CORPORATE OUTING FOR CO-WORKERS AIMING TO BUILD A TEAM RELATIONSHIP OR INTERESTED IN ENTERTAINING BUSINESS CLIENTS, WE HAVE EVERYTHING YOU NEED, ALONG WITH OUR FRIENDLY HELPFUL STAFF WHO WILL SEE THAT YOUR OUTING WITH US IS BOTH A SUCCESSFUL AND UNFORGETTABLE ONE. 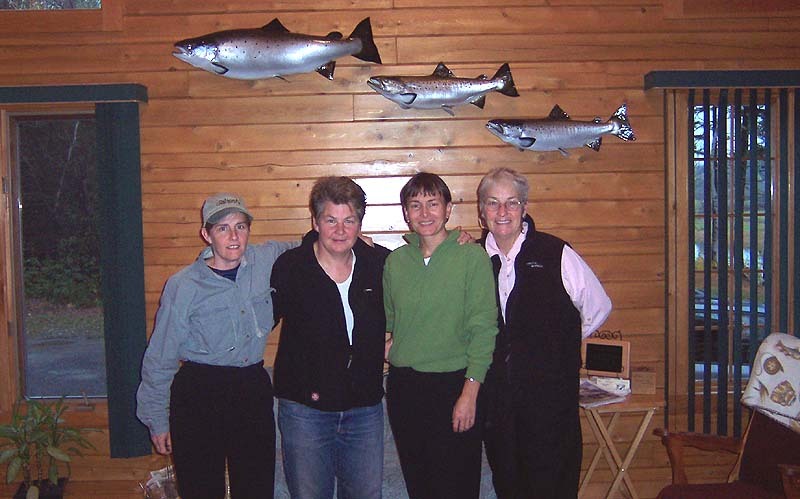 Theresa LeBlanc - California, Sally Stoner - California Jackie Girouard - Bouctouche N.B. 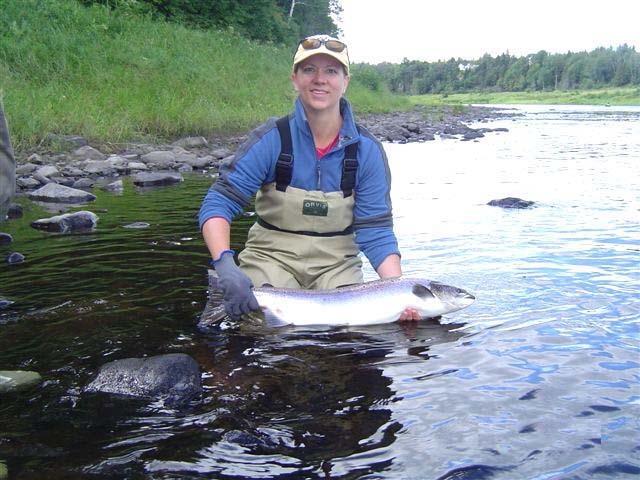 AT COUNTRY HAVEN WE HAVE SEEN AN INCREASE EACH YEAR IN THE NUMBER OF LADIES ENJOYING THE ART OF FLYFISHING FOR ATLANTIC SALMON WITH OUR EASY WADING POOLS AND ACCOMMODATING GUIDES. 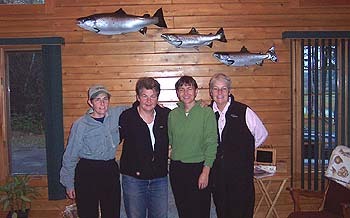 MANY OF OUR FEMALE GUESTS HAVE BEEN ENJOYING SOME GREAT SUCCESS. 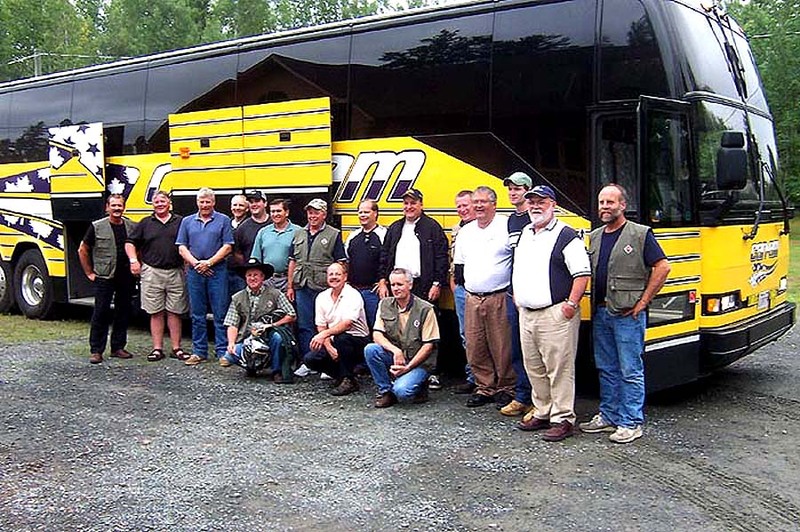 WITH ALL OUR PACKAGES WE CAN INCLUDE SHUTTLE SERVICE FROM AIRPORTS, ACCOMMODATIONS, MEALS, GUIDES, FISHING LICENSES AND EQUIPMENT,IF NEEDED. ALSO, IF YOU ARE A GOLFER, OUR PACKAGES CAN INCLUDE A ROUND OF GOLF AT EITHER OF OUR TWO QUALITY MIRAMICHI GOLF COURSES. 2019 PACKAGES Canada still has an exchange rate that makes many foreign currencies worth more in Canada, including the US$, British Pound and the Euro. This will allow us to offer Special Rates for some packages in 2019. Throughout the year we occasionally offer Special Promotion Packages based on availability, value and easy accessibility by air travel from various locations to Country Haven. These all-inclusive no-hassle fishing vacations on the Miramichi River have never been so easy to enjoy! Both of the packages below (New Yorker and UK Special) have been offered since 2008 and have been so popular we have decided to still continue to offer these two specials again for the 2019 season. - Includes Flights from NY area Airports. 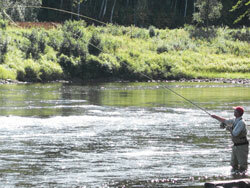 - 4 star accommodation in Lodge or private cottages on the Miramichi River. - Individual casting Instructions if interested. 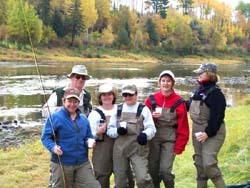 - Fly fishing for wild Atlantic Salmon throughout 27 of the Miramichi River private fishing pools. - Airport Shuttle to Airports. 3 day 4 nights package including one stop flights into NB Airports - $1,850 US. 5 day 6 nights package including one stop into NB - $2,650 US. 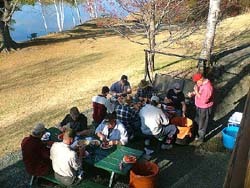 5 day 6 nights package including nonstop flights into Halifax and shuttle to Country Haven - $2,750 US. - Approximately 6 hr flight from UK Airports. - 7 Full Days of fly fishing for Wild Atlantic Salmon in our 22 private pools/beats -Or- Guided Whale, Bear & Moose Sighting Tours. - Depart in the evening for the UK. 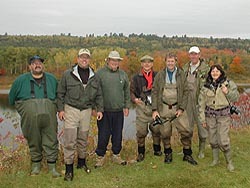 - Lifetime of memories included..
A fully Inclusive 7 day Atlantic Salmon Fly Fishing Adventure on the Miramichi River. 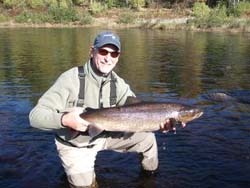 This clinic will again be run by Bryan Martin, holder of Both the Salmon and Trout APGAI qualification - the leading UK advanced professional fly casting and fly fishing instructors qualification, plus everything that is included in our all-inclusive week package, with or without airfare (Direct return flights with Air Canada from London (Heathrow). East Coast Spey from New Jersey USA will be returning to Country Haven, this year (September 29th - October 5th) 2019 and (October 6th - 12th), and will be providing free casting lessons along with 5 full days of Atlantic Salmon Fishing. 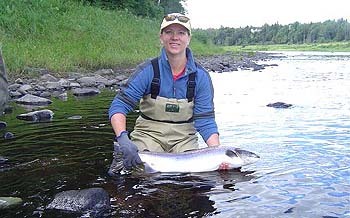 Click Here for a slide show of photos from previous sessions provided by East Coast Spey. 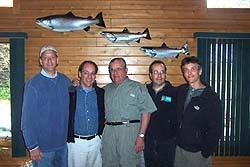 Coming to Canada for great fishing?